Serving Westcliff, Southend on Sea and Leigh on Sea. It's lovely to feel confident with my smile after so many years of feeling self-conscious. From only £600 for fixed braces to just £1500 for Invisalign and the Inman aligner! Straumann implants available for optimum, minimally invasive dentistry. We are a professional dental practice offering a range of the highest quality treatments in general, preventative and state of the art cosmetic dentistry. Our team of dentists and hygienists offer specialist services in dental implants, teeth whitening, Invisalign, Six Month Smiles, veneers and hygiene treatments. We understand our patients want the best oral care and customer service from us. Our team are here to make you feel comfortable and answer all the questions you may have about your treatment and general oral health. Whether you’re a nervous patient or have been undergoing long term treatments, Westcliff Dental is committed to providing you the best in dental care. 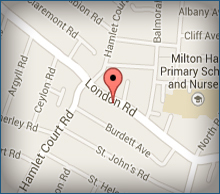 Our clinic serves the Westcliff, Southend, Leigh on Sea, Thorpe Bay and wider Essex area. We take NHS, private and Denplan patients and provide emergency dental services. I am really very pleased with the outcome and feel much less conscious or concerned about my teeth now. The difference is amazing, my teeth look so much better. I feel the treatment was very worthwhile. Southend on Sea and Leigh on Sea. Copyright © Westcliff Dental Practice. All rights reserved.